Magnetic Hooks at Magnets For Sale come with pull forces of 9, 18, 28, 63, 110 LBS. Magnetic Hooks are a great organizational tool and utilize the hidden space in your home or office for storage. Hooks in different forms have been with us throughout history. Fish hooks were probably some of the first ones created with a sharp stick to enable early man to catch fish. A barb on the end of a spear is another type of hook derive. During medieval times of course there was the grappling hook that enabled the user to climb to the top of castle walls. Fortunately for us the use of hooks is usually a little more civil than in medieval times. Now days we use hook magnets as an inexpensive and effective means to neatly store items in the home. Some of this space was previously unavailable to us before using these magnetic hooks. Place these magnetic hooks on the face of your refrigerator door to hang your keys on or a great place to hang your tea towels for ready use. However the magnetic hook allows you to place the hook on the face of the refrigerator door and you will never lose your keys again. This however is only the beginning for our heavy duty magnetic hooks. If you take 2 of our strong magnetic hooks and cradle a dowel between them you have a towel rack that can display your tea towel with that great witty saying about your favorite wine. Are you planning to go on a cruise and need a place to hang some of your items to be ready at a moments notice? Beautiful place for your strong magnetic hooks. CMS Magnetics has adhesive pads that allows you to place a magnetic hook to a window to tie off vine type house plants right to the window where they create can create a beautiful design and the plants get the most benefit from the sunlight. 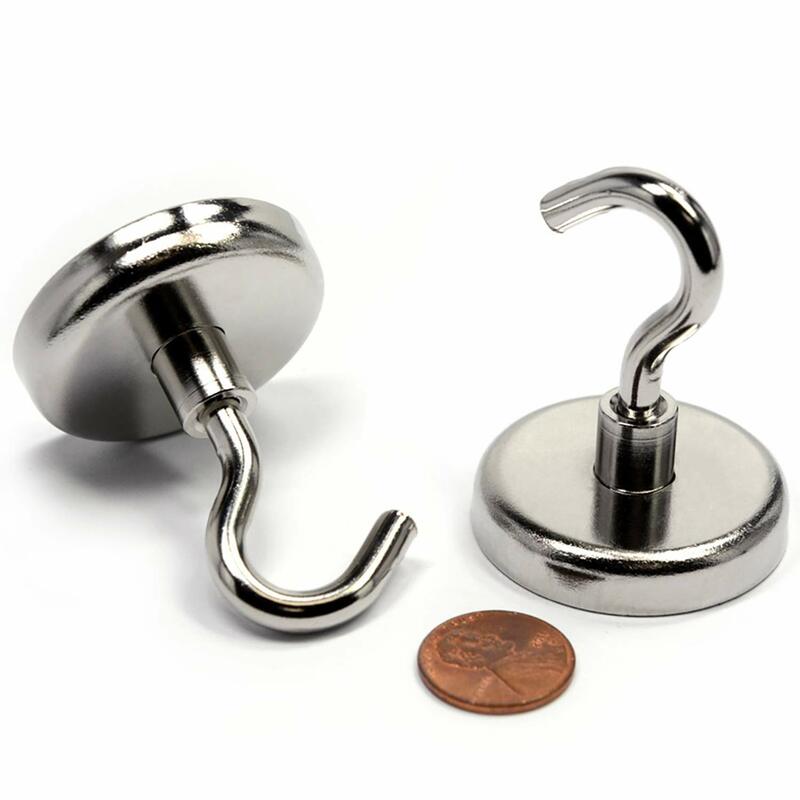 CMS Magnetics' magnetic hooks come in many differing strengths from a standard 8 LB pull Force to a super strong magnetic hook with over 100 lbs. pull force. Our magnet hooks come in a variety of durable powder coated colors and packaging sets from single strong magnet hook to 6 in a package. The hook sizes vary as well from the in demand large hooks to small magnetic hooks to the low profile almost completely hidden hooks. 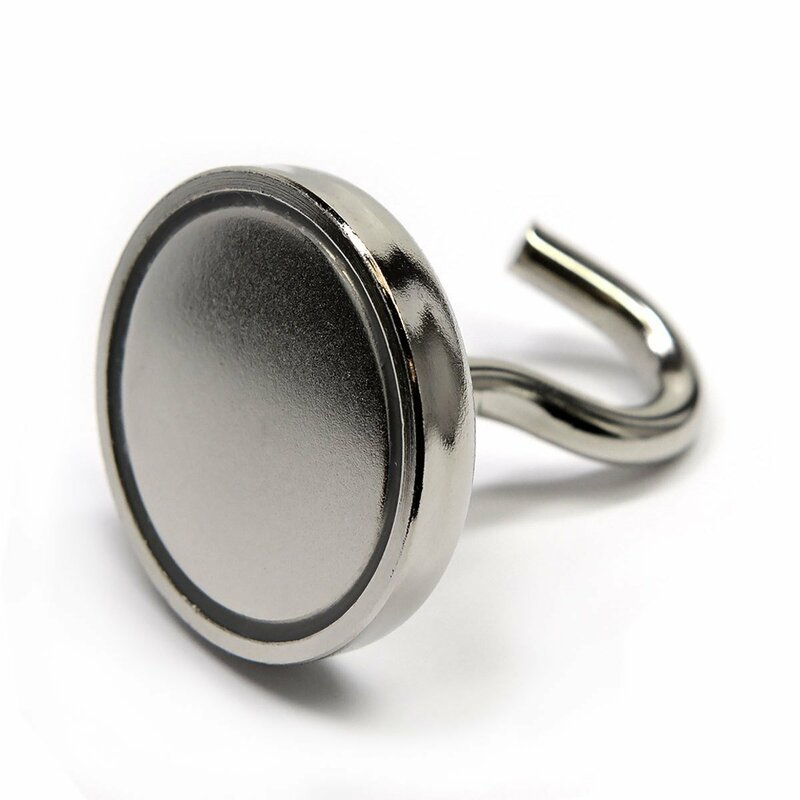 These magnet hooks can be used in the yard to hang festive lighting sets from the pergola when used in combination with our countersunk metal discs by screwing the discs to the wood and hanging the heavy duty magnetic hooks to the discs. They will be very easy to remove during the winter and easy to put back up in the spring. In my yard I hang my garden tools in the greenhouse (metal frame) everything from hand trowels to my wheelbarrow and fertilizer spreader are hung from the wall using either ceramic magnetic hooks to the much stronger neodymium magnetic hooks. Teachers in the classroom use CMS’ magnetic hooks to hang decorations and school work. These magnetic ceiling hooks may be hung from the metal separators in the drop ceiling or the fluorescent lights. These hooks are especially well suited for the decorations that change season to seasons or events. CMS Magnetics has our manufacturing team use only the most strict quality standards and materials to ensure customer satisfaction by preventing corrosion and the physical failure of our magnetic tools and assemblies.